Hello and welcome to our live coverage of the Day 2 of the ranji Trophy 2018-19 final between Vidarbha and Saurashtra being played at the Vidarbha Cricket Association Stadium, Jamtha, Nagpur. 4: 37 pm IST: Saurashtra are five down with Akshay Wakhare taking his second wicket. Sheldon Jackson falls for nine as Saurashtra slump to 153/5. However, opener Snell Patel is going strong and is on 85. 3: 46 pm IST: Arpit Vasavada gets a ripper of delivery from Akshay Wakhare. Saurashtra lose their fourth wicket for 115 runs on the board. 3: 12 pm IST: A big big wicket for Aditya Sarwate as Cheteshwar Pujara falls for just one. After a steady start Saurashtra seems to lose their way. They are 89/3. 50 for opener Snell Patel. 11: 50 am IST: And at the stroke of lunch, Kamlesh Makvana cleans u Rajneesh Gurbani to signal the end of Vidarbha innings at 312. Akshay Karnewar remains unbeaten on 73. From 139/6, Vidarbha’s last four added 173 runs. Three wickets for Saurashtra skipper Jaydev Unadkat. 11: 40 am IST: Umesh Yadav falls, but Vidarbha go past the 300-run mark against Saurashtra. 9:30 am IST: Vidarbha start day two on the back foot, at 200/7. Their hopes will be pinned on Akshay Karnewar,who batted with Akshay Wadkar on Day 1 to dig his time out of a hole. Even though Wadkat was sent packing by Chetan Sakariya, Karnewar is solid in the middle. For Saurashtra, they know their bowlers have done an excellent job on day one and it is a matter of repeating the same on day two as well. Saurashtra took the top honours despite losing the toss reducing the defending champions to 200/7 courtesy a disciplined bowling attack from the bowlers. Skipper Jaydev Unadkat led the way with two wickets – one of which included the big scalp of Wasim Jaffer for 23. Vidarbha at one stage were 139/6 before lower-order pair of Akshay Wadkar and Akshay Karnewar put in a solid resistance late in the day. Skipper Jaydev Unadkat removed run-machine Wasim Jaffer with a gem of a delivery as Saurashtra dominated the opening day of the Ranji Trophy 2018-19final by reducing defending champions Vidarbha to 200 for seven on Sunday. It proved to be a good toss to lose for Saurashtra, who succeeded in removing the most impactful Vidarbha batsmen – Jaffer (23) and captain Faiz Fazal (16) – cheaply. Unadkat was consistently accurate with his nagging line and length while Sakariya swung the ball and troubled the batsmen with movement. 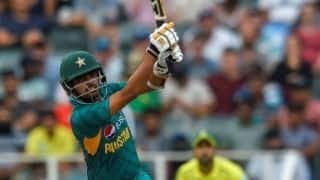 The defending champions struggled to create partnerships and had it not been for the 57-run seventh-wicket stand between Akshay Wadkar (45) and Akshay Karnewar (31 batting), they would have been in more mess. Batting at number eight, Karnewar produced some lusty hits in a sensible knock in the final session. Saurashtra would fancy their chances from here on, having finished runners-up twice in the last seven seasons. Sakariya got only one wicket (he was unlucky not to get Jaffer lbw) and that too towards the fag end but was easily the best bowler of the day. In 14 testing overs he bowled, the diminutive pacer conceded just 13 runs. Prerak Mankad (1/27), Dharmendraisnh Jadeja (1/72), and Kamlesh Makvana (1/46) took one wicket apiece. However, all the action unfolded before empty stands despite it being a Sunday, with a handful of school students cheering for the home side, often teasing the fielders in the deep. Sakariya was rewarded when Sanjay went for a lazy drive and just managed an edge, which was taken by Arpit Vasavada in first slip. Fazal too went back soon, though, in a bizarre dismissal. 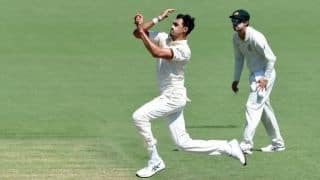 He rather gifted his wicket by slowing down a few steps away from the crease, thinking the throw from the deep is going towards the other end. Sakariya also troubled Jaffer with moving ball and seemed to have caught the king of domestic cricket plumb but the vociferous appeal did not move the umpire. Medium pacer Mankad and left-arm spinner Jadeja replaced the two opening bowlers but it was skipper Unadkat who dealt another blow to the hosts. Just before the lunch, Unadkat brought himself into the attack and struck big. He got one move away from Jaffer, who, without moving his feet, fished and edged it to wicket-keeper. Unadkat jumped with joy and his fist-pumping celebration showed what the wicket meant to his side. The innings moved at a snail’s pace with hosts taking lunch at 67 for three in 33 overs. Kale and Satish resumed and surprisingly Unadkat did not bowl in the beginning of the second session. Jadeja created an opportunity when Kale flashed one hard to edge it behind but first slip Harvik Desai reacted late to see the ball pass him. However, after some time Kale literally steered one from off-spinner Makwana to first slip and Desai did not miss the chance this time. Before the wicket fell, Unadkat bowled a probing outside off line with perfect field setting. He kept hitting short of length, never giving batsmen any opportunity to go for drives. Wicketkeeper Wadkar, who had scored 98 against Uttarakhand in the quarterfinal at this venue, too offered good resistance as the hosts took tea at 130 for four. Mankad got rid of Satish while Jadeja did not let Aditya Sarwate open his account in the final session. Sakariya ended the resistance from Wadkar and Karnewar by removing the former, three overs before stumps.